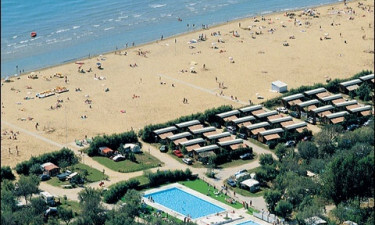 Camping Lido is situated at Bibione Lido on a peninsula between the Adriatic Sea and the River Tagliamento. 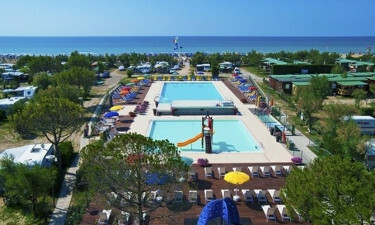 This luxury camping site is made all the more special with direct access to the sandy shores of the Adriatic Sea. Camping Lido has 3 BMJ Crocky clubs divided by age and dedicated to keeping kids laughing all day. An aquatic area is right on the sea and offers two swimming pools with slides. LuxCamp accommodation is a mobile home with all the amenities of home. The scent of the pine forest and sound of the waves lapping on the shore give Camping Lido an atmosphere of tranquillity. With all the day and nighttime entertainments, Camping Lido goes out of its way to ensure that all family members fully enjoy their camping holiday. The beach, onsite restaurants and washroom facilities are wheelchair accessible. Luxury camping on the Adriatic Sea is hard to beat. We have compiled a brief list of must do activities. Camping Lido’s aquatic area is surrounded by a wide terrace for sunbathing. A shallow children’s pool is equipped with two fun slides. For older children and adults, the larger pool is a generous 25 meters long and features a hydro massage. Breathing in the fresh air of the Adriatic and watching the seabirds skimming over the water — there’s nothing more to ask of a peaceful seaside holiday. 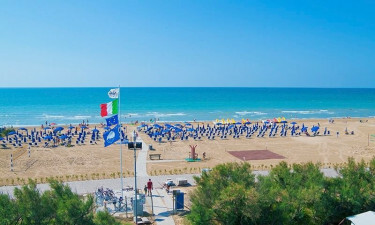 The wide and sandy beach at Camping Lido is idyllic for sunbathing and swimming.